They said to her, "Woman, why are you weeping?" She said to them, "They have taken away my Lord, and I do not know where they have laid him." When she had said this, she turned around and saw Jesus standing there, but she did not know that it was Jesus. Is Mary comforted by the words of the angels - or further confused? She turns and sees Jesus but does not yet recognise him... why not? We are reaching the climax of the story - but are not there yet... Read the passage a few times and see what ideas or thoughts begin to emerge. Make a note of your thoughts - jot them down. If you are praying the Novena with others, prepare to receive the insights of others. Spend a few minutes building the scene in whatever way you have found has worked for you. What fears might be within Mary at this point - and what hope against hope? We who know the story know what's coming and have a feeling of anticipation - but Mary does not. We can often find ourselves wondering, what will be asked of me? Will I like what I see and hear? Will something live up to my expectations? even you could not at first recognise your Lord. for those for whom there is fear of disappointment. Jesus said to her, "Woman, why are you weeping? Whom are you looking for?" Supposing him to be the gardener, she said to him, "Sir, if you have carried him away, tell me where you have laid him and I will take him away." She turned and said to him, "Rabbouni!" (which means "Teacher). How did Jesus approach Mary? At what point did Mary recognise her Lord? 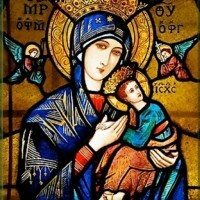 One of our longest pieces in the account of Mary on that first Easter morning... Read it through several times and allow any significant words or phrases to sink into your soul. Why are they important to you? Make a note of them and use them to feed your mind and spirit. Spend a few minutes building the scene in whatever way you find most helpful. If as a film director - enjoy the scene unfolding... if in imagination - simply enjoy! Many people have moments of recognising something that holds promise and builds on the many good things that have been happening. Pray for them - for the moment of grace which may affect the rest of their lives. as we learn to recognise our Lord in Word and Communion. and love of countless millions of believers around the world. Jesus said to her, "Do not hold on to me because I have not yet ascended to my Father. But go and tell my disciples and say to them, 'I am ascending to my Father and your Father, to my God and your God.'" It seems a little of the story has been missed out... what might Mary's reaction have been that caused Jesus to tell her not to cling to him? What about when she is sent to the disciples? And what of their reaction? Read the passage a few times and see what ideas or thoughts emerge. Look back over your journal or take a mental trip back over the last nine days. Read the whole story - reminding yourself of the thoughts that accompanied it. Your personal insight will remain personal - but reflect on how your prayer and perhaps those of others might deepen your own insights. Spend a few minutes building the scene in whatever way you have found has worked for you. Allow the scene to play out in your mind. How do the feelings change?